The task of community based conservation is vast and, at times, overwhelming. Partnerships are vitally important. With partnerships, resources multiply, strengths complement each other and efforts find synergy. Community Cloud Forest Conservation has developed strategic partnerships that allow for the multiplication of resources. CCFC seeks win-win and win-win-win scenarios in conservation. CCFC’s resources can be used to match the needs of others while the resources of others can fulfill the needs of CCFC. CCFC’s Kids & Birds Initiative partners with the Cornell Lab of Ornithology’s BirdSleuth program. This partnership allows CCFC to extend our reach to elementary schools in remote, rural villages that border the cloud forests of the central highlands. Beginning June 1, 2011, CCFC is improving education in these village schools. 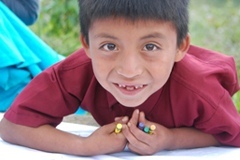 CCFC’s receives funding from US Fish and Wildlife for its Kids and Birds initiative through the grant: “Community Based Bird Conservation through Citizen Science in Guatemala. This partnership allows us to work at a grass-roots level with 4th, 5th and 6th graders as well as with adults, teachers and committees involved in the local schools. These local secondary campuses draw students from the outback regions of the highlands to the west and east of Coban. Bartolo Perla and Don Bosco both offer vocational arts classes to their students. However, more often than not, the school does not have wood to supply for their carpentry class. When CCFC needed beds for its agroecology scholarship students, these schools helped us meet that need by building beds. CCFC is thrilled to be a part of this strategic partnership with the University of Mary Washington. For the last five years, CCFC has directly benefited UMW geography students by facilitating cross cultural learning experiences in the central highlands of Guatemala. An exchange learning visit scheduled for March of 2016 will be the seventh time CCFC has hosted UMW geography students. Students from past trips have helped CCFC with GIS and other geo-referenced analysis. CCFC’s partnership with MEI Secondary School has provided two years of cross cultural exchange experiences for both Canadian secondary students and for Q’eqchi’ youth from remote, rural villages that border the cloud forests. In 2009, visiting MEI students learned Q’eqchi’, explored caves and Maya ruins, planted native cloud forest trees in deforested areas in a village of the Sierra Yalijux. They also learned cross-cultural communication and the life skills needed to learn and grow in an environment very different than their home. In the same way, Q’eqchi’ speaking young women from remote villages lived with Canadian families, visited community-based ecotourism destinations in Canada, visited the Canadian Rockies, got to watch a hockey game, visited first nations communities in western Canada, learned English, went ice skating, saw a herd of elk, and gained a metric ton of self confidence. UPROBON, Unión para Proteger el Bosque Nuboso – Union for protecting the cloud forest. CCFC helps UPROBON in community development and education by offering special agroecology work-study scholarships in the mountain village of Chelemha’. Over the last three years, CCFC has also brought more cloud forest visitors to the Chelemha’ lodge than any other conservation organization. CCFC nurtures its relationships with and supports conservation efforts in a wide variety of private reserves. By facilitating visits to these reserves, CCFC is adding economic value to conservation. CCFC also works with land owners for the arrangement of reforestation and conservation agreements.